Okay, I will pause from Supergirl show news for a day to get back to comics. It was something of a slow comic week for me with only 2 issues in my pull file. With a few extra bucks in my hand, I decided to make a couple of impulse buys. 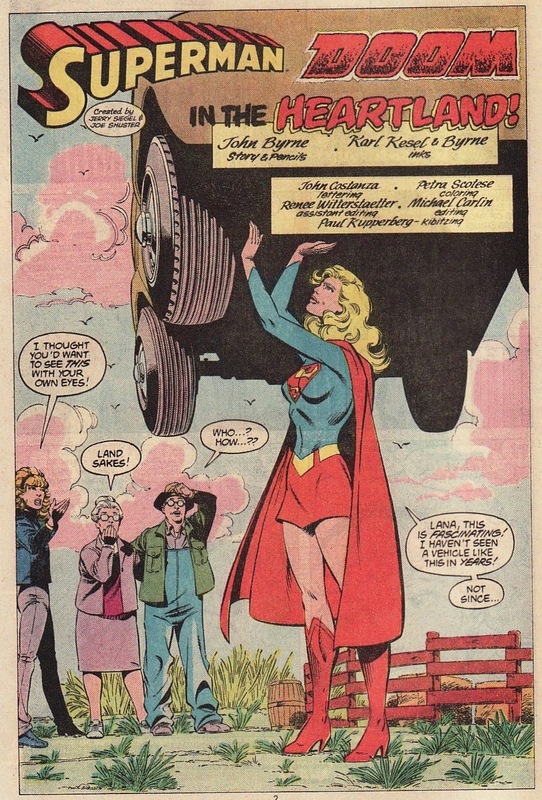 And, as is often the case, luck was with me as many had a Supergirl moment for me to ponder. So I figured I would share my musings. 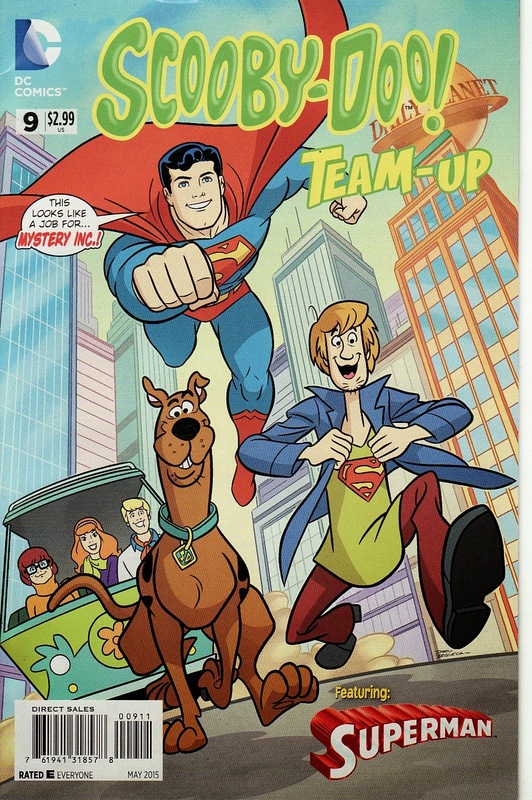 First up is Scooby Doo Team Up #9, a fun little issue where the Scooby Gang have to foil the plans of the Prankster while trying to rein in a Red Kryptonite enraged Superman. Writer Sholly Fisch and artist Dario Brizuela already gave us a great issue teaming up the Mystery Machine and the Superfriend in Team Up #6 in a story that included 'Rupergirl'! So I figured I should grab the issue and have some fun and then play it forward to a younger reader. We don't get Supergirl in this issue but at least she is name-dropped. The Scooby Gang uses Jimmy's signal watch to try to bring Supergirl to Metropolis. But she doesn't respond. Instead Krypto arrives. Things get even crazier as they try to stop both the monstrous Superman and the Prankster. At one point, Shaggy drinks the Elastic Lad serum and Scooby gets powers. While there weren't many new books for me to buy, the dollar box was plentiful. I was in the midst of a 'nearly only Vertigo' period in my comic collecting so I wasn't getting Superman on a monthly basis. So this issue, Superman #20, was missed. There is was in the dollar box! As I have said, I liked Byrne's reboot if only because it breathed new life into the mythos, a way to reimagine and meet these characters again. 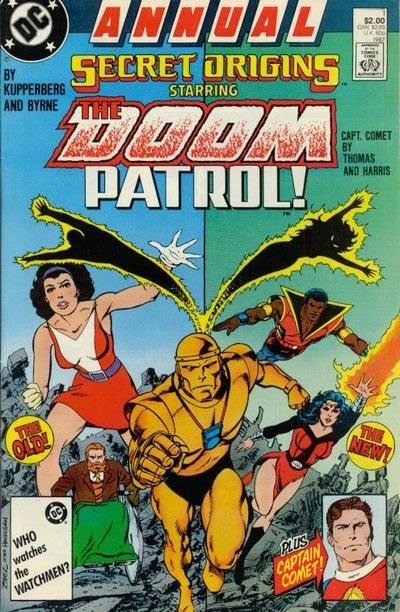 Plus, there is the Doom Patrol! But then I got this treat! The Matrix Supergirl!! We first met her back in Superman #16, buried under the ice. Here she is in Smallville, living with Lana. We knew almost nothing about her at this time. She was sort of a blank slate. But here she is, in that red skirt costume I love, hoisting a tractor. The sight of Ma and Pa Kent is shocking to her. She says they are dead. She talks about Lex. And then she goes catatonic. Next issue began the incredible important Supergirl Saga, redefining Supergirl and having Superman execute the Phantom Zone villains of the pocket universe. That story sets up Superman's exile into space and opened up a whole other year's worth of stories. I am sooo happy I bought this. I love Byrne's art in this time period and Matrix is perfect! This is my favorite version of Supergirl's costume ... similar to the upcoming show's costume! Now this issue I know I did own at one point but it had become lost! 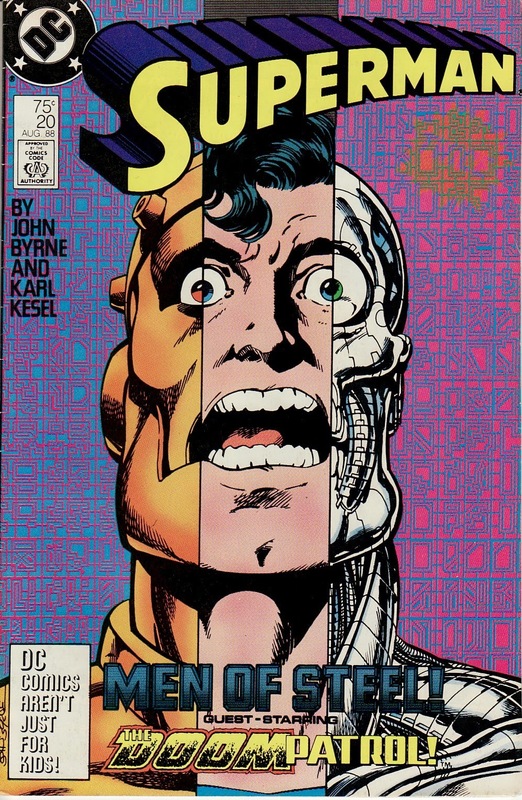 So I was so happy to find another copy of Secret Origins Annual #1, another John Byrne/Doom Patrol issue! In case you can't tell, I love the Patrol. So this issue, the prequel to the rebooted comic by Paul Kupperberg and Steve Lightle, is a great primer on the team. So what is the Supergirl connection here? Well, this was only 18 months after the end of Crisis on Infinite Earths. The history of the DC universe was still in flux. What was in? What was out? How do you rewrite things when key characters ... like Supergirl ... no longer existed. Ever. Well, it means that the prior Supergirl/Doom Patrol crossover, the adventure when they fight Reactron together, is now a Power Girl/Doom Patrol crossover. 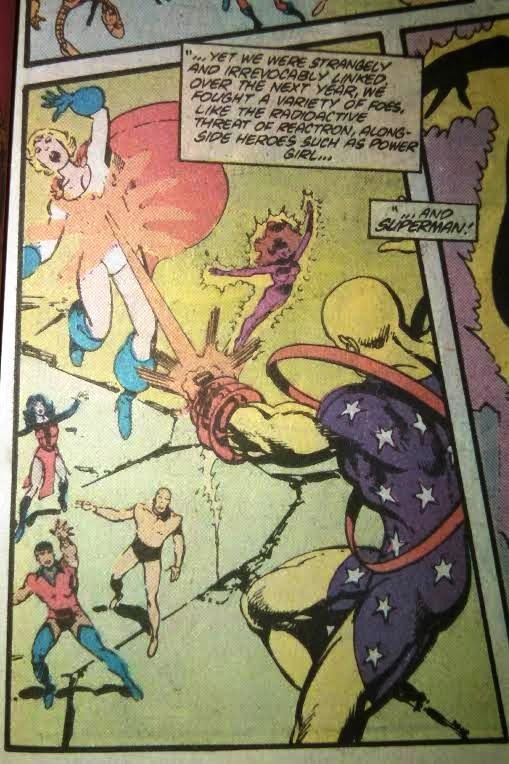 This was just months after Power Girl's origin was rewritten as Arion's descendant. But this just reminds me that there was a time when Supergirl simply didn't exist. Her adventures were recast or erased. And that seems so foreign now in a world where she has had hit books and a television show in production. Anyways ... those are my Tuesday musings. 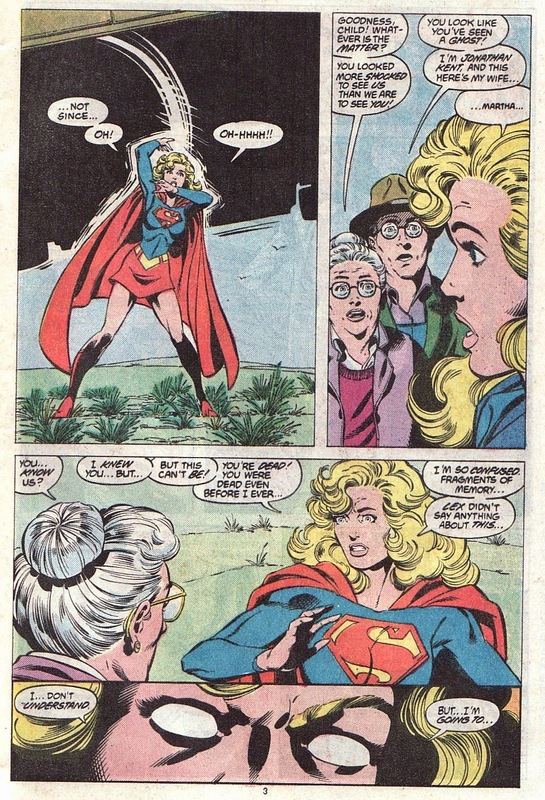 On superherohype, someone wrote he'd appreciate to see Power Girl join Supergirl's serie in the future, in order to open the door of a classic SG storyline. As he said, if the show's a success, who knows which characters could be added in the future seasons ! I would appreciate PG, or the Legion, and why not some less poupular characters (in terms of rates) not necessary linked to Kara, but who would find here a good opportunity to appear on screen. Metal Men, and Doom Patrol, as examples, could be good candidates ! Glad that you had the chance to fill holes in your collection, but I'm not impressed with those issues. The "Sole Survivor From Krypton" mandate was dumb, dumb, dumb and made more harm than good. Three decades later, DC is still trying to fix that mess. And I find hilarious that Giordano told Kara's creators didn't give her creation much thought and then OK'd Matrix, a character whose only purpose was to keep the name trademarked.